That holistic understanding was reflected in an implementable and sustainable process design. This intense workshop provides proven, repeatable methods, well beyond what is covered in introductory courses. In particular, individual and organisational behaviour and culture often defy analysis, but specific techniques for discovery and assessment of these soft factors are a centrepiece of this unique workshop. Throughout, the emphasis is on methods that support shared understanding and engagement, leading to buy-in. 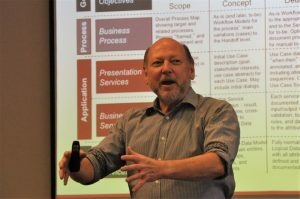 Participants will be well-prepared for the challenges of successful business process analysis and design. Topics will be covered with a discussion of the issue, a review of techniques, guidelines and examples, a brief workshop exercise, and a group solution and debriefing. The emphasis is on maximising the delivery of content while keeping everyone engaged. Real-life case studies are employed throughout – some participants say the examples of how the techniques are applied in practice is the best part of the workshop. Anyone involved in Business Analysis, Business Change, and Business Process Management (BPM) especially BPM professionals, Process Analysts and Designers, Process Architects, Business Analysts, and Project / Programme Managers. Also, Business Managers responsible for effecting process change, and Organisation Development professionals needing to learn more about business processes. It would be helpful, but not be absolutely essential, to have some practical experience with process analysis and redesign, or an introductory course in working with business processes. Recent, real-life case studies and examples are used throughout to illustrate the methods.